I have been testing Bush Beard Care Co ‘Janissary Blend’ Beard Oil for the past few days. Bush beard Co has furnished the page for this oil with great detail about who the Janissaries were and why this oil is reminiscent of them, you can read it here. Basically the Janissaries were the elite infantry of the Ottoman Empire in 1383 and as they were forcibly converted to Islam, they were banned from ever touching alcohol. Instead they either drank tea or Coffee and it is coffee that is used in this oil. Janissary Blend Beard oil from Bush Beard Care Co is certainly without doubt a coffee scented oil, it’s a Dark Roast Coffee, Cardamom and Vanilla aroma, the main scent player here is without doubt the coffee and I managed to pick up the Vanilla in the background, but for me unfortunately the coffee is a bit too strong and that might be to do with the fact that I am a tea drinker, but I have spoken with a fellow bearded gent and he loves the strong coffee scent and I know that many guys love the strong coffee aroma. However I don’t judge an oil merely based on its aroma, it’s a big part but its a very personal thing and the base oil and the way it makes your beard look and feel is very important and that is a good thing to remember when choosing a beard oil. ‘Janissary Blend’ has a very good base, it’s quite a light oil and it left my beard feeling good and gave it a healthy appearance. Janissary Blend Beard oil from Bush Beard Care Co is a base of Jojoba, Sweet Almond, Pure Apricot, Grapeseed, Kukui Nut, Vitamin E and Aloe Vera carrier oils with a blend of , Essential Oils, with a blend of Coffee, Cardamom and Vanilla essential oils with a couple of whole Coffee Beans thrown in. 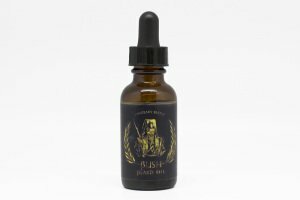 Janissary Blend Beard oil from Bush Beard Care Co comes in a 1oz bottle with a glass dropper for $11.99 or 1.25oz corked vial for $14.99 from the Bush Beard Care Co website. Bush Beard Care Co. is a men’s care company based out of Port Jefferson, New York. Us here at Bush are dedicated to creating all natural grooming products that are free from chemicals, colourants and fragrance oils. All of our products are created using all natural locally sourced ingredients and created in small batches to ensure freshness and quality. Vitamin E – The health benefits of vitamin E come from its antioxidant properties. Antioxidants remove free radicals — the unstable compounds that damage the cell structure. It helps by moisturising the hair from root to shaft and stimulates hair growth while doing it. WE DO NOT AND WILL NEVER USE COLOURANTS, PRESERVATIVES, PETROCHEMICALS OR FRAGRANCE OILS. 1 FRAGRANCE OIL CAN CONTAIN OVER 200 CHEMICALS IN IT. OTHER COMPANIES MAY TAKE THE EASY WAY OUT AND USE PRE-MADE FRAGRANCE OILS, BUT NOT BUSH! ALL OF OUR PRODUCTS ARE ALL NATURAL AND ALWAYS WILL BE. THIS STUFF IS GOING ON YOUR FACE, PEOPLE. REMEMBER THAT AND STAY HAIRY. ← Oh this is weird, hang on….it’s not!